Please join us on Saturday, December 8 at 5pm for the world premiere of composer George Lam’s The Emigrants, for cello, percussion, and recorded oral history. The Emigrants will be premiered by the ensemble New Morse Code (Hannah Collins, cello and Michael Compitello, percussion). This special concert will also feature Queens-based musicians Duo Yumeno and Rafael Leal, who are featured on the recorded interviews that are a part of The Emigrants. * please note that after 4:30pm only the museum entrance on the Grand Central Parkway side (not the entrance facing the park) is open. 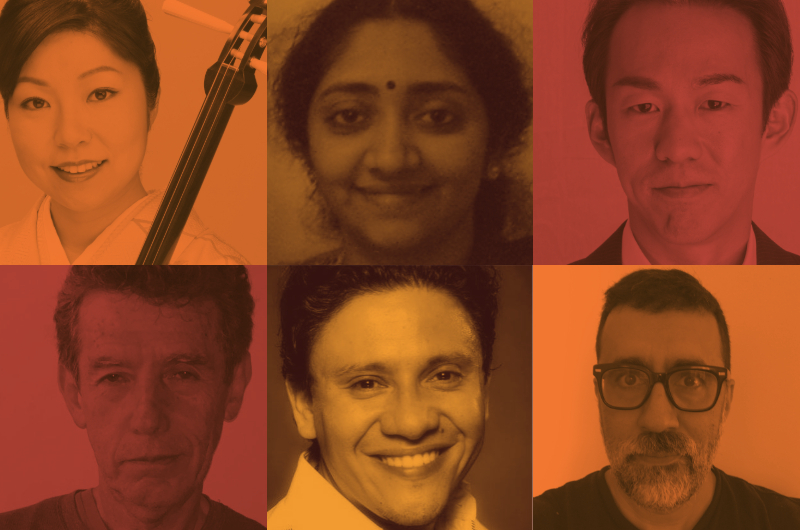 George Lam’s new documentary chamber music work The Emigrants explores the stories of seven emigrant musicians living or working in Queens, focusing on their move to the United States, and how music continues to be an integral part of their lives today. Can a piece of music help us explore and better understand the people who chose to leave their homeland and come to the United States to find new beginnings? In addition to the premiere of The Emigrants, this special event will also feature performances by three of the musicians George Lam interviewed for the project: the cello and koto ensemble Duo Yumeno, and Colombian percussionist Rafael Leal, as well as a conversation between the composer and the interviewees about their own experiences as emigrants to the United States. For a peek into the production of The Emigrants, click here to view the trailer! Composer George Tsz-Kwan Lam (b. 1981) grew up in both Hong Kong and Winthrop, Massachusetts. George studied music at Boston University, the Peabody Conservatory, and Duke University, where he received his PhD. George is interested in works that intersect music, theater, and the documentary process, and his current projects include the cello-percussion duo The Emigrants for New Morse Code (Lawrence, Kansas) and a new cantata for Hong Kong Voices. Recent commissions include works for Oak Middle School (Shrewsbury, MA), the Romer String Quartet (Hong Kong), Asian Young Musicians Connection (Taipei, Taiwan), Black House Collective (Kansas City, USA), and Synergy Percussion (Sydney, Australia). George Lam is an Assistant Professor of Music at York College, The City University of New York. In addition, George Lam is also a co-artistic director of Rhymes With Opera, an NYC-based ensemble that commissions and produces new operas. New Morse Code is devoted to bold and engaging performances of music worth sharing. Omnivorous, rigorous and inventive, Hannah Collins and Michael Compitello activate the unexpected range and unique sonic world of cello and percussion to catalyze and champion the compelling works of young composers. To Hannah and Michael, collaboration involves drawing upon mutual influences while generating and refining material together over an extended period of time. Through close work with colleagues such as steel pan virtuoso Andy Akiho, Hawaiian composer and visual artist Tonia Ko, and Pulitzer Prize-winning composer Caroline Shaw, New Morse Code generates a singular and personal repertoire which reflects both their friends’ creative voices and their own perspectives. Hannah and Michael were finalists in the 2014 Concert Artists Guild Competition and recipients of a Classical Commissioning Grant from Chamber Music America with composer Christopher Stark. Their debut album, Simplicity Itself, described as “a flag of genuineness raised” (WQXR) was released in 2017 on New Focus Recordings. Through its outreach initiative New Morse Kids, the duo has inspired young listeners with eye-opening performances and engaging presentations at the Norfolk Chamber Music Festival, Yale’s Morse Summer Music Academy, Community MusicWorks, and Greenwood Music Camp. In addition, they have given classes and worked with composers at universities across the United States. Hannah and Michael are co-directors of the Avaloch Farm Music Institute, a residency program in Boscawen, New Hampshire designed to provide resources for performers and composers collaborating on new works. They both teach at the University of Kansas. This world premiere performance of The Emigrants is made possible in part by the Queens Council on the Arts with public funds from the New York City Department of Cultural Affairs in partnership with the City Council.